What is a proton ? What is a neutron ? What is an Atomic Number ? What is a Mass Number (of an atom)? What is Relative Atomic Mass? What is an isotope ? A molecule is a group of atoms held together by covalent bonds. Some people confuse the words 'compound' and 'molecule'. Both of these are the result of chemically joining together atoms of different elements. A molecule is the smallest unit (particle) of a compound that has the physical and chemical properties of that compound. This does not mean that molecules cannot be broken-down into smaller parts e.g. the atoms of which they are formed or fragments of the molecule, each consisting of several atoms or parts of atoms - because electrons may attach to fragments of a molecule in such a way as to result in fragments (called 'ions') that are not neutral like atoms, but have either a positive or negative charge. However, if a molecule of a compound is broken into smaller parts then those parts would not be particles of the original compound, but of some other substance(s). Molecules consist of one or more atoms joined together by covalent (chemical) bonds. Atoms may be represented by drawings of circles, each of which has a nucleus at the centre (containing protons and neutrons), surrounded by one or more concentric circles representing the 'shells' or 'levels' in which the electrons surrounding the nucleus of the atom are located and markings indicating the electrons at each level. Small molecules can also be represented in this way but such drawings quickly become unnecessarily over-complicated. 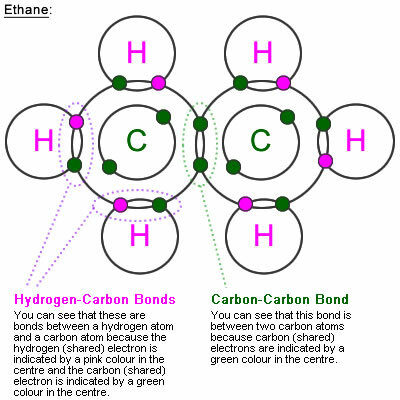 A molecule of ethane results when two carbon atoms and six hydrogen atoms join together in the configuration shown below as by sharing electrons, as described in the text (below the diagram). In the simpler diagram above the connections between atoms, called 'chemical bonds' (in this case 'covalent bonds') are represented by short straight lines. Both of the diagrams representing molecules of ethane (above, and above-left) are simplifications because matter generally exists in 3-dimensions so may be more accurately represented by 3D models. These models show the relationship between atoms (represented by the individual 'balls') and molecules (represented by the complete units of 'balls' representing atoms, attached together by 'sticks' representing chemical bonds). In these examples, the white balls represent atoms of hydrogen, the black balls represent atoms of carbon, the red balls represent atoms of oxygen and the blue ball represents and atom of nitrogen. Note: This is one of a series of simple pages introducing key concepts in introductory chemistry. Other pages in this section include elements, mixtures and compounds and individual pages about substances, elements, mixtures and compounds, plus pages about atoms, molecules and isotopes. If you need further information ask your chemistry tutor.